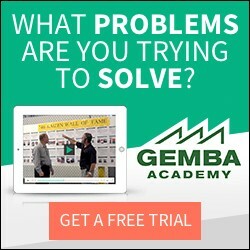 I got a good reality check from a Six Sigma Master Black Belt who was attending one of our Lean master classes last month. In the case of the true root cause being in the design process rather than at the point of occurrence, Six Sigma type of analysis and problem solving via Design of Experiments becomes necessary. A cosmetic defect (why?) caused by a tool contacting the finished surface (why?) caused by the awkward angle of screw tightening with said tool (why?) caused by the inadequate method design using the existing standard tool (why?) caused by the part design (why?) caused by the design of the mold cavity used to make the part (why?) led to a discussion with designers on various fluid dynamic properties of polymers and cetera. Genchi gembutsu doesn’t cut it at this point, in comes Six Sigma. Six Sigma level quality may not be technically necessary to have a thriving Lean implementation. Five sigma or even four sigma may be sufficient if it is predictable and stable at those levels. You can flow and pull around stable quality, even if it is not high quality. Zero defects is the goal and effort should be directed towards it. In this sense the ultra-Six Sigma culture is essential for a kaizen culture. The best of the Six Sigma people I have met described Six Sigma not as a set of tools or methodology but as a culture, a way of thinking. Six Sigma is not only for improving quality just as Lean is not just about reducing waste. Lean is also more a way of thinking and behaving than a set of tools or methodology. What we mean by kaizen is the type of continuous improvement approaches based on values and practices such as “go see”, total involvement, small-practical-immediate action and the scientific method. Some kaizen events I’ve observed have failed to follow all of these. Some Six Sigma work, and even projects done with no particular brand of continuous improvement methodology, but working based on these values I would call kaizen. Kaizen is a spirit and Six Sigma is essential to it.